This month on the Golf House Dinner Menu members will find two of Executive Chef Jim Mercer’s favorite winter cravings. 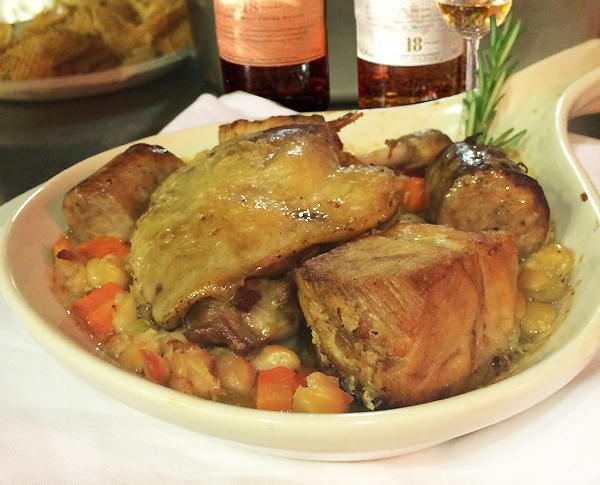 The first item is the French White Bean and Meat Casserole, Cassoulet. There are many versions of the recipe, however Chef Mercer leans towards the one from Toulouse. This variety features Tarbais Beans, Duck Confit and Garlic Pork Sausage. Cassoulet is not a difficult dish, especially if you spread out the preparations over a few days. You will however need to know how to make Duck Confit, a skill Chef Mercer says you will not regret. This method yields a most delicious, at the ready duck meat for a fast appetizer or pasta filling. 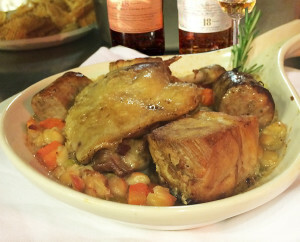 Having enjoyed Cassoulet with a glass of red wine at Hamersley’s Bistro in Boston some 25 years ago, Chef Mercer quickly learned how to prepare this dish and it has been a part of his winter menu repertoire ever since. Another item he can’t go without during the cold winter months is Raclette Cheese from Switzerland. This extremely pungent and tasty, cow’s milk cheese is likely considered the original fondu. All one needs to do is to hold the cut side of a wheel of cheese in front of a fire and “rake” it off onto bread or boiled potatoes. The popular Raclette machine is the Swiss counter part to the American toaster. Both of these dishes are fine and satisfying items during the chilly winter months. Bon appétit! Blane Toedt, Restaurant Manager and Corey Nuffer from Westport Rivers Vineyard and Winery recently held a series of Wine Nights at the Golf House restaurant. 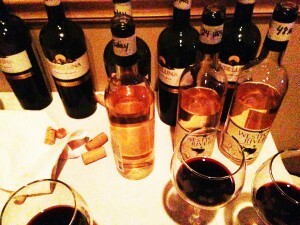 During these hour long wine seminars Corey educated members on a different wine topic each week. Her inaugural event, The Champagne Method helped members to understand why Champagne tastes differently from Prosecco, Moscato, Asti and Cava. She also explained the difference between Champagne from France and everywhere else. Members not only heard about the differences but they were able to taste them as they sampled wines available at the Golf House. Her next seminar Aging Your Wines explored just what goes on when a wine ages, beginning with why you swirl your wine in a glass. Members did a vertical tasting of wines aged not years, but days. And for the final seminar, Food + Wine Pairing 101, Corey took a nod from the teachings of Master Sommelier Randa Warren and covered the basics. In addition, Executive Chef Jim Mercer prepared a variety of food pairings to show a little of what can go right and what can go wrong when it comes to what’s in the glass. Nuffer’s approach to wine is informed by her background in biology, theology, and music. Managing at an Italian restaurant as well as a country club provided the space necessary for a new approach to wine education to emerge. After being selected for an internship at Chicago’s NPR affiliate, WBEZ, Nuffer moved to Chicago to work with a New York Times bestselling author. This led to an editorial position for a Food + Drink section of Chicago magazine. Currently, Nuffer helms the educational outreach as well as representation of Westport Rivers Vineyard and Winery here in Massachusetts.